LONDON--(BUSINESS WIRE)--‘MAKESTAR’ (https://www.makestar.co/?locale=en), the world’s first crowdfunding E-commerce company specializing in Korean Wave contents (Hallyu), is organizing a joint project between Korean best small & medium enterprises and renowned Korean YouTube creators. 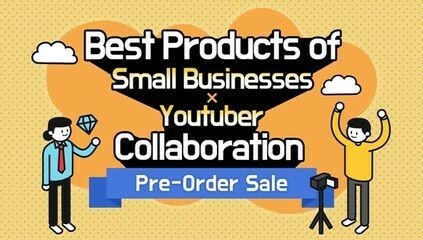 In this project, professional YouTube creators share personal product reviews and demonstrate excellent qualities of each product, including ‘Mineral Water Daily Skincare Mask Pack – SPA CARE MINERAL MASK PACK’, ‘FINDEN SKINBEBE SKIN CARE products with the Know-How of Northern European Mothers’, ‘MYPINPLUS – Microphone for One-person Creator in the World’, ‘BODYGUARD CERAMIC COAT / GLASS GUARD – All-in-One Vehicle Maintenance Set for My Valuable Car’. The event can be found at MAKESTAR website (https://www.makestar.co/projects/md_techcode_01/?locale=en) and will be held until the end of February. In the endless competition against huge competitors at the Red Ocean, Korean products are gaining attention in the world market with quality and ideas. Here are some of these products that stand out.